We’re almost through our 12 days of Gluten-Free Christmas Cookies hosted by the fabulous Maggie of She Let Them Eat Cake. Tomorrow you get to share your favorite recipes on Maggie’s website for a chance to win some amazing prizes. Do you have a recipe ready? Is it an old family favorite, or something new? My second contribution to the 12 Days of Gluten-Free Christmas Cookies is a new recipe – something that we’ve never had before, but has been declared an instant tradition. Yes, I’ll be making these for years to come. Saying it’s a new recipe is stretching things, just a bit. 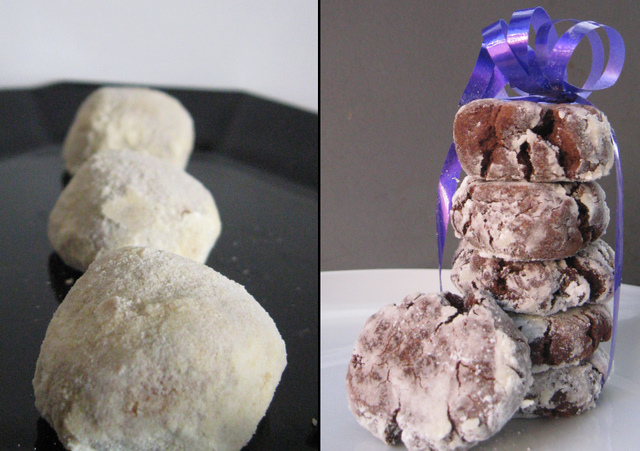 It’s really a combination of concepts from two recipes that show up every Christmas in my family, Russian Tea Cakes and Chocolate Crinkles. In fact, I made gluten-free versions of both of those cookies before landing on this particular gem. 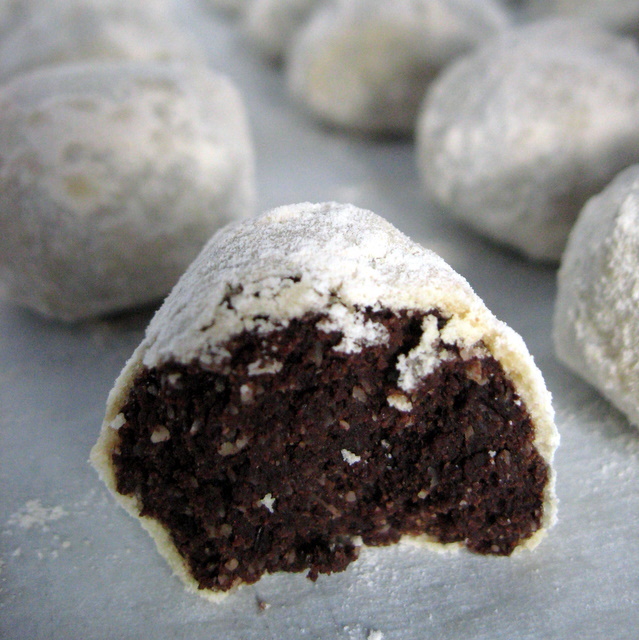 So, I took the powdered sugar-coated ball of goodness concept from the Russian Teacakes, and the chocolate goodness from the Chocolate Crinkles and made…wait for it…. Chocolate Snowballs! And the best part is that they’re grain-free, vegan, and refined sugar free, and are actually better after sitting for a day or two. I know – amazing, isn’t it? Chocolate Snowballs - Oh So Yummy. In the top of a double-boiler, melt the chocolate and coconut oil. While that is melting, whisk together flax seed and almond milk in the large bowl. When the chocolate is melted, remove from heat and pour into the flax seed mixture. Add the palm sugar and vanilla and beat well. In a small bowl, combine the rest of the dry ingredients, except the powdered palm sugar. Whisk well. Beat the dry ingredients into the wet ingredients until well combined. As soon as the cookies come out of the oven, roll them in the powdered palm sugar. (Yes, they’ll be hot. You can do it!) Once completely cooled, roll them one more time in the powdered palm sugar. If you like this recipe, be sure to check out all the other recipes for 12 Days of Gluten-Free Christmas Cookies! This entry was posted in Blogger Community, chocolate, cookies, desserts, grain-free, nuts, vegan and tagged Christmas, cookies, gluten-free, grain-free, vegan. Bookmark the permalink. I love these and I love the name! Callum would LOVE to eat chocolate snowballs, simply because of the name! I love seeing how you make a traditional cookie super healthy and tasty! Thanks for everything Deanna! Thank you – Maggie – for hosting such a great event! These were a super big hit with Soren. I think the sugar on the outside gives it a big sweet “kick” even though the cookie itself isn’t that sweet. And, we all know how kids love sweet stuff! I **love** that you used my all time fav flour – Garbanzo-Fava! YUM!! It is so good for adding structure and nutrients to baked goods. It just works so darn well. My hubby would love these…he can’t get enough of Russian Tea Cakes. Maybe I’ll make the cookies GFSF and then roll his in real powdered sugar. Not my thing but, oh, how he loves it! These look incredibly good! Sugar-free, dairy-free, gluten-free…just my style. 🙂 Can’t wait to try these, whether it’s the holiday season or any time of year! Thank you Hallie! I hope you try them and report back! Thank you Heidi! I think they’re even all safe for your chocolate monster and you, no? Deanna, these look SOOOO yummy! I marvel at your creativity! 🙂 And I’m also loving the fact that you made your own powdered palm sugar. I avoid cane-sugar, use palm sugar in my baking like nobody’s business, and have ALWAYS wondered if I could make powdered palm sugar but never tried it. Thanks for doing my research for me… haha! Thank you Desi! Yep, powdered palm sugar isn’t as white as powdered cane sugar, but it works and seems to have the same effect in baked goods. Go for it! What a wonderful idea. I’m not a huge fan of Russian tea cakes or Mexican wedding cookies or Swedish whatever they call them either. But this is a recipe I could definitely get behind. Even better there’s only one thing in the entire recipe I’m allergic to and since that’s gar-fava flour it’s a total nonbrainer. Thank you for sharing this. Wow – allergic to gar-fava? That’s a new one that I haven’t heard before. What do you usually substitute? Deanna! What amazing pictures! These cookies look to-die-for! They are, in fact, absolutely BRILLIANT! I love the creativity of this group! And, dare I say, these are actually pretty healthy looking, all things considered. I will so be making these. I am with my Mom right now and she already is planning on when we will get to them. As soon as sis is home from the hospital! Working on the post for the Gbread house contest right now. Will email you the link once it is live!! Thanks so much, Kim. Can’t wait to see all the gingerbread houses – but it sounds like you have bigger things to handle right now. We’ll be here when you get back. I hope your sis gets better soon! These look awesome, thanks for sharing! Gluten free AND vegan! Being that I am a recent gluten freer, I don’t have a lot of experience with GF cookies. I love these so much & they look awesome! I must make these soon! I just tried these little goodies today, Deanna and they turned out fabulous!! I put xylitol and stevia in them instead since I can’t have sugar…..I thought my little guy would like them since they look like timbits he USED to be able to eat before I put him on GF/CF diet….I made a glaze to drizzle on some, some cinnamon-icing sugar for a few more….and of course left the rest plain for myself! LOL! Thanks sooooo much for sharing as we are chocolate lovers and want to make healthier choices. I wanted to try them with just almond flour next time, what do you think? I’m so glad you liked them, Deb, and that they worked with your changes. I’m not sure if they’d work with all almond flour. I have a feeling they’d be more crumbly. But, it’s worth a try, right? Thanks for sharing this recipe, Deanna! It’s listed on my blog as one of the gluten-free treats that I’ve drooled over this Christmas season. http://www.glutenfreecat.com/?p=2403 I’ll be baking them soon! Hope your Christmas was merry! I am already saving this recipe for Christmas. Just up my alley. Just one question: what is gar-fava flour? Never heard of this before. Straight garbanzo bean flour would work fine, too – it just tastes a wee bit more “beany” to me. I must have been super busy to have not commented when you posted this recipe last year. I remember seeing them and thinking how fabulous they looked! Looking at them again, I’m even more impressed. Totally yummy and brillant, Deanna! Thanks, Shirley. I wonder if it’s too soon to start Xmas baking…. Can you use the Better Batter flour in these cookies? they look awesome! Hi Pam. I’ve never used Better Batter flour, so I’m really not sure. If you try it, be sure to report back and let me know if it worked! These were great, delicious, great texture. The palm sugar was a beast, I grated by hand and got a great workout. It was a solid disc from an Asian market. How do you manage yours? I tried chopping, using a metal mallet, dropping on concrete.. It didn’t want to break up. I’m glad you liked the cookies! Excellent! So glad you liked them. Happy holidays!